Having walked the howlways of the iconic school together since the beginning, they now come together in a two-pack of dolls that lets girls send them on a date right out of the box! And dressed in retro roller skating outfits, girls' imaginations can really take off. 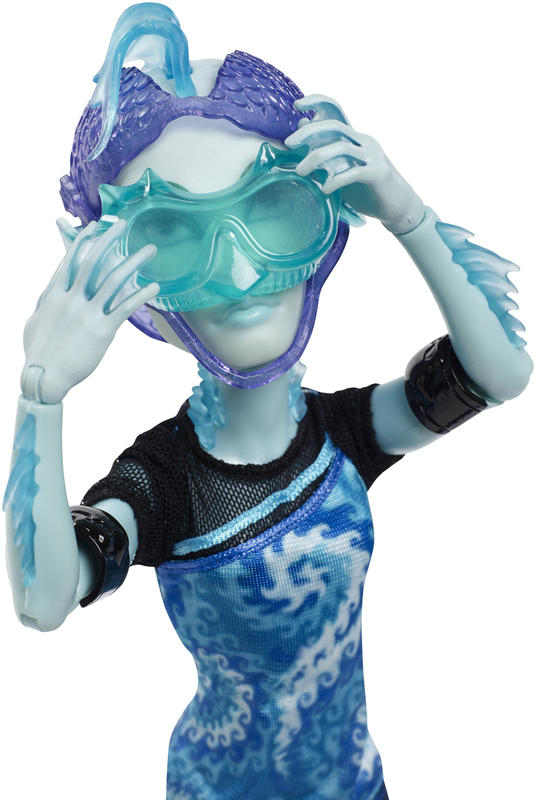 Daughter of the Sea Monster, Lagoona Blue™, makes waves in a gore-geous patterned skating romper with pink belt and ruffled collar. Golden skates with blue fin accents look monsterrific with golden safety gear, including a finned helmet. Gilllington ""Gil"" Weber™, Son of the River Monster, makes his own splash abandoning his signature helmet for sportier goggles and breathing tube. They match his purple patterned shorts, colorful wave-inspired shirt, black safety gear and black roller skates with fins. Girls will love taking this twosome out on a retro skating date to ""sea"" where it goes! Also included is a doll stand for each allows them to capture uhhh-mazing moves for play and display. 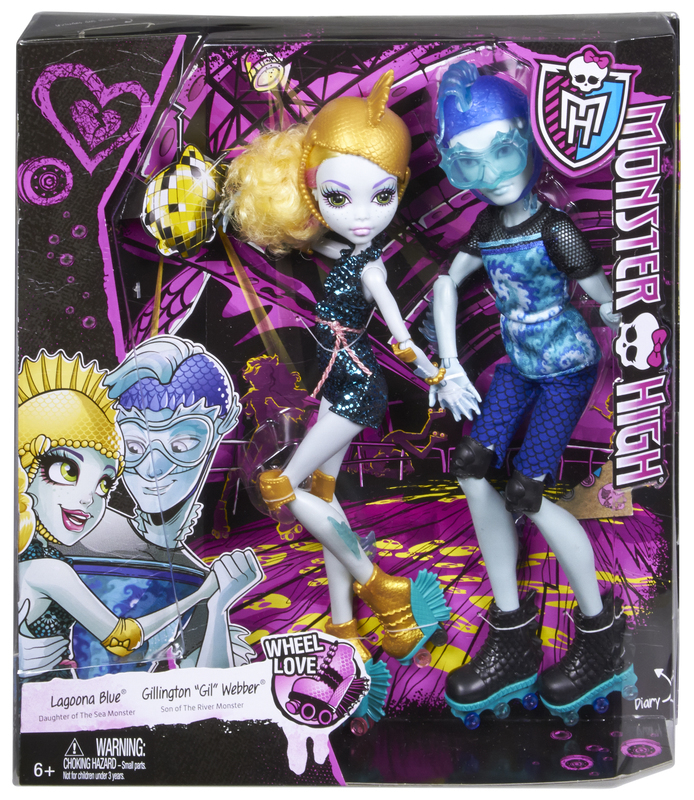 Gillington “Gil” Weber™ and Lagoona Blue™ dolls are available together in a two pack! Lagoona Blue™ doll makes waves in a gore-geous patterned skating romper with pink belt; golden skates with blue fin accents look monsterrific with golden safety gear, including a finned helmet. Gilllington “Gil” Weber™, Son of the River Monster, makes his own splash abandoning his signature helmet for sportier goggles and breathing tube. They match his purple patterned shorts, colorful wave-inspired shirt, black safety gear and black roller skates with fins. 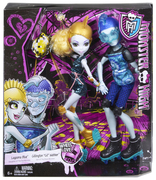 Pack includes Lagoona Blue™ and Gillington “Gil” Weber™ dolls wearing fashions and accessories that include roller skates, elbow pads, knee pads, a helmet for Lagoona and goggles with breathing tube for Gil, plus two doll stands.